If there’s anybody that loves promotional products, it’s our country’s politicians. For years they’ve branded bumper stickers, buttons, shirts, banners, flags, yard signs, and just about anything else they can fit their names on. But some candidates, like Ron Paul in this example, take promotional merchandise to the next level! 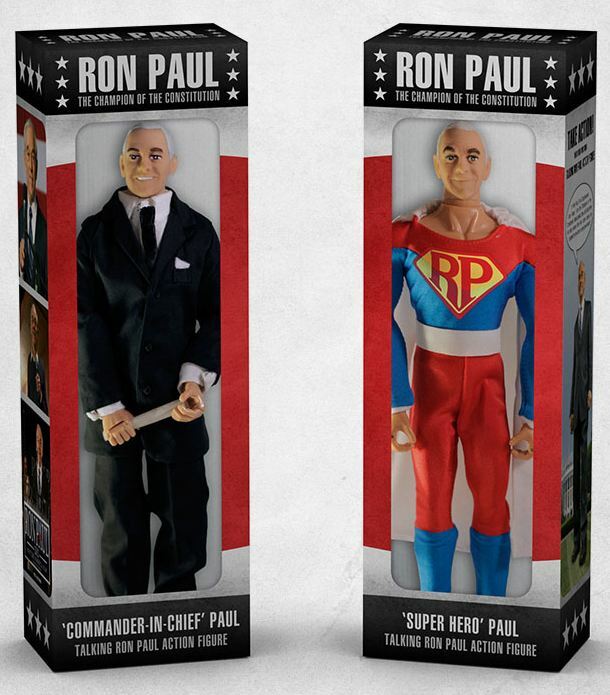 Ron Paul’s Revolution PAC announced yesterday a line of collectible action figures bearing the likeness of the Republican presidential candidate. These limited edition custom toys stand 12″ tall and come in two styles: “Commander-In Chief Paul” comes with a sharp suit and mini U.S. constitution; “Super Hero Paul” is clothed in a stylish cape. Both figures speak a message and come with a price tag of $94.95. Regardless of your personal politics you have to give credit to the creative brains behind these instant classic political promos. Although they aren’t cheap they are sure to be in high demand among vocal supporters, and they even create an opportunity for Ron Paul’s campaign team take a jab at the other candidates: “This is the only way that Ron Paul can be bought,” says Revolution PAC chair Gary Franch.